Rhubarb Custard Pie – springtime means fresh Rhubarb is ready to be picked, imagine this in a custard pie, and here is our recipe for this famous pie. Springtime and early summer always meant the Rhubarb was ripe. 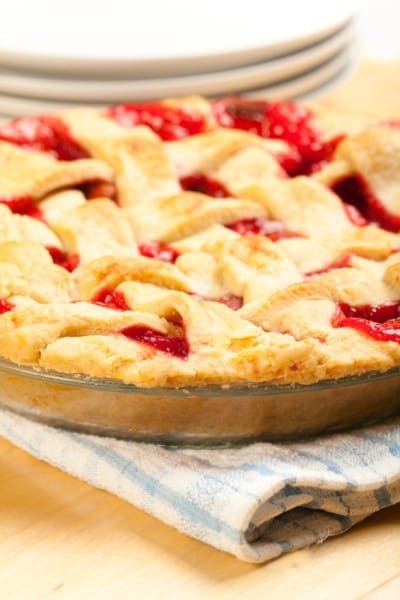 We would have Rhubarb preserves, Rhubarb and Strawberry pie, and this Rhubarb custard pie. This is from the archives of my grandmother, Ethel Eynard. Jefferson City, MO. 1981. In the spring it's always time to make my Grandmother's famous Rhubarb Custard pie. Beat eggs, milk, sugar, flour, cinnamon and vanilla in a large bowl just until blended. Stir in rhubarb. Roll out half the pastry to fit a 9-inch pie plate. Spoon in filling; dab with butter. Roll out remaining pastry; cut in 1/2 inch strips. Weave strips over filling for lattice top. Pinch top and bottom crusts together; turn under; pinch to make a stand-up fluted edge. Brush pastry with milk; sprinkle with sugar. Bake at 400 degrees for 45 minutes or until pastry is golden brown. This looks good! I’ve never had Rhubarb pie. I’ll have to try it.